I have viewed four videos that deal with training flushing dogs. All have been informative and, if the advice is followed, would probably result in a serviceable gun dog. However, all have,"holes" in the information where the viewer may wonder,"What do I do now?" or "What if I don't have or want that item of equipment?" Basic Gundog Training by Martin Deeley is a video in which a more systematic approach is used to instill control in a gun dog. Mr. Deeley assists the viewer to develop a gundog from puppy to perhaps a year old or older - depending on the dogs rate of development. If the advice/ideas are adhered to, the result should be a dog that is ready to be shot over and hunted. The equipment that Mr. Deeley uses is, for the most part, relatively inexpensive and easy to obtain. 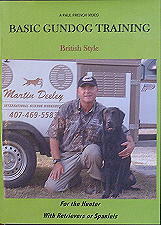 Martin Deeley's approach to training emphasizes patience, and understanding of what the dog is doing. It is a positive approach that avoids the need for physical discipline. Mr. Deeley sets the dog up to succeed by using "short, sharp bursts of training" and avoiding tiring the trainee. "Quit while you're winning," is just one of Mr.Deeley's sound bits of advice. Basic Gundog Training utilizes steps that are interrelated; with each step building on the previous steps. Much of the training can be done in one's backyard, in a park or near-by field. Since dogs must be taken out irregardless of whether they are trained, why not train at these times? While I found all of the video interesting, one segment that was particularly so was where Mr. Deeley was handling a young Labrador retriever. As Mr. Deeley holds him, he controls the squirming and biting of the puppy by simply squeezing gently until the puppy complies and then he relaxes the hold. His calm, quiet demeanor is also important in relaxing the puppy. Mr. Deeley recommends turning a puppy on its back, examining its feet, looking into its mouth, etc... much as a veterinarian or groomer might do... to ready the puppy for visits to these people. Mr. Deeley utilizes a rabbit pen during some of the training sessions. Most viewers will not have access to such a pen, a point which Mr. Deeley notes. However, a viewer may wonder about alternatives to the pen. There is footage in the video that shows how to use tennis balls and retrieving dummies to teach the dog to hunt and retrieve in heavier cover. Perhaps the viewer will make the connection between this and the pen. Another facet of gundog training is water work - which was not adressed. After viewing the video, I wondered if the viewer - especially a first time trainer - might ask,"Where do I go from here?" Obviously, the dog will be taken hunting. But what pitfalls and setbacks may arise because the dog is in unfamiliar places and experiencing the excitement of live game? Perhaps there will be a follow-up to this wonderful video that addresses such issues. However, Basic Gundog Training is a worthwhile video that will assist the trainer - especially an inexperienced trainer - to develop a gundog of which they can be proud. Mr. Deeley does not overpower the viewer with information and complicated techniques. Instead, he instills a confidence that says, "I can do that!" If I were to own only one video about training flushing dogs, Basic Gundog Training by Martin Deeley would definitely be a consideration. There is a well explained progression of steps for training a gundog. However, even more meaningful is the calm, positive demeanor modeled by Mr. Deeley. To me, this alone makes the video worthwhile. Happy, enthusiastic, and loving dogs are a testament to Martin Deeley's training techniques. Available on VHS or DVD - 120 minutes - Copies are available at the Spaniel Journal Bookstore. Don Smail has been actively training and field trialing English Springer Spaniels for over twenty years. He is a member of the Northeast Wisconsin Spaniel Club and resides near Wausau.